I just came back from a very hot (temperatures were in the neighbourhood of 30 C.) bicycle ride to Floral Clock just a half hour ride north of Niagara Falls along the Niagara Parkway. 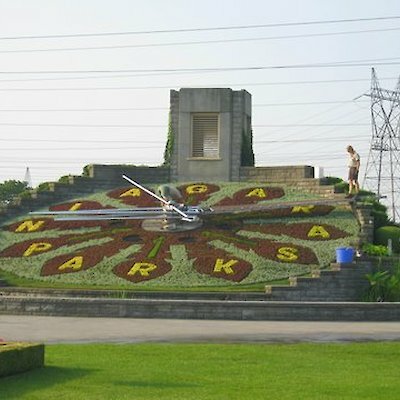 While I was taking a drink of water I saw two employees of The Niagara Parks Commission doing some, “touch –ups” on the face of this year’s clock. It struck me that the Niagara area is filled with numerous truly world-class attractions and many of them are free to see and enjoy. This is one of them. 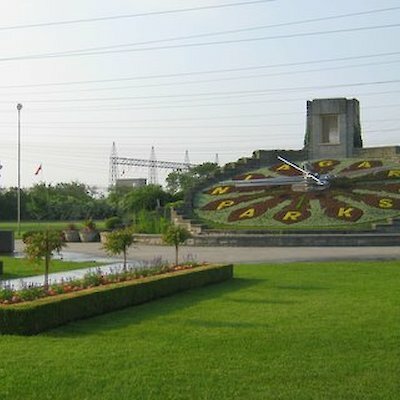 The Floral clock was built in 1950 by Ontario Hydro (now known as Hydro One) on the north side of the Sir Adam Beck Generating Station #1.It was inspired by the famous floral clock found in Princes St. Gardens in Edinburgh, Scotland. Today, The Niagara Parks Commission has assumed the designing, planting and maintenance of the clock. About 19,000 plants are required to make up the design. No, I didn’t count them I got the information from the park employees. See if you can find the second employee in the accompanying photograph.